Mid-March is upon us, which means the time has come to pay homage to the bloody red god of war, Mars. You did know that the Ides of March, this coming Sunday, were traditionally dedicated to the Roman deity of brutal battle, right? Somehow, I anticipate that more of you will be participating in St. Patrick’s Day parades than martial processions. What will you be celebrating this weekend and will it involve birds? Share your plans in the comments below! This weekend is my son, Mason’s birthday weekend which means family festivities and fun. However, I don’t think owls or any other kind of birds fit into the equation. Corey will be birding of course, probably in the company of at least a couple of fellow bloggers. If you’re in the NYC area, either look out for the maelstrom of micropublishers on the trail or jump right in! Charlie, fortunate Charlie will be watching birds in Cape Town this weekend. Sounds like fun, right? Remember that we’re in the midst of Mesoamerican Month here on 10,000 Birds. 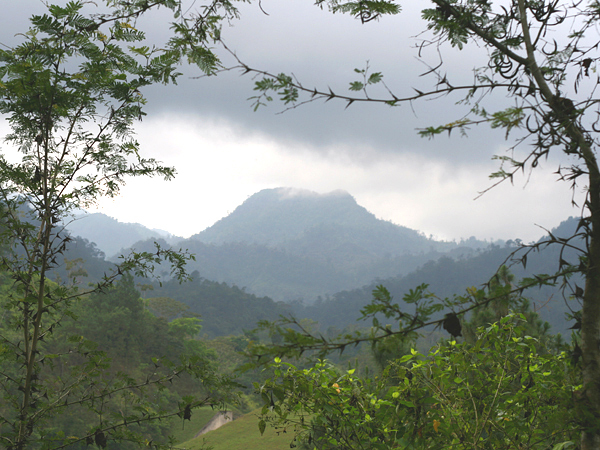 Enjoy this misty view along the route to Cerro Azul Meamber National Park in Honduras. I’ll be birding in the hills and valleys of Central PA. Happy birdday to your son! Brilliant mountain picture – thank you! This weekend I shall be birding a long the Cumbria coast, England. Great picture of the mountains of Honduras. I think I will be birding in Daniel Boone National Forest in Kentucky. It almost looks like the sky is frowning! Gorgeous layers! Love the layering! Cool shot. I might be out in the Viera Wetlands at Florida’s Spacecoast. A nasty cold will keep me close to home here in NJ. But birding I will be! I will be prowling some wet meadows and grasslands in hopes of snipe, among others. Gorgeous shot of the mountain and the clouds! I like the wisp of cloud right at the peak of the mountain! The birds here are getting more vocal, and soon the robins and redwings will be out in force. I do better with scenery than with birds, but I drop in on you occassionally! I’m hitting up the Magic Hedge at Montrose beach in Chicago tomorrow morning for the first time this year! Oh I didn’t do any birding this weekend. We had the first rains this time around in Bangalore, India. So I sat at home and enjoyed watching the landscape getting drenched. Crane Hollow in Hocking Hills Ohio. Saw a Woodcock. Mainly woodpeckers. Still no Warblers yet. Honduras is now high on my bucket list. This weekend it’s the Platte River in Nebraska watching sandhill cranes.